The complexity of cross vocational ministry has be to addressed by each and every pastor pulling double-duty. You have to evaluate time spent at work, at church, with your family, with your church family, in Sabbath and in labor. No cross vocational pastor will be able to do it all. They must make strategic modifications to their ministry approach in order to maximize their time and their efficiency. Let me offer 5 suggestions which might help you modify ever so slightly. 1. Use your cell phone as a conference room channel for team meetings. Get everyone on the phone using the merge call function and have them open up individual laptops. Once everyone is connected, use a shared church calendar or virtual planning app and let everyone contribute in real-time. You might not be able to pull off a full, in-person staff meeting because everyone is at their “other” job, but you can plan and connect as a team if you are thinking ahead. 2. Use text messages & social media to connect to people that you won’t see during the week. With your day-job absorbing the bulk of your time, you might only see your congregation when you are in the actual building. To make a connection without being present, send a personal text message, post on the church’s social media channels, or write a church wide email. Each digital touch gives your people a chance to connect with you, even if it is only with a “like” button. 3. Write stock notes to be delivered when others make hospital visits. There is no way you will be able to make all the visits and surgery runs. If you have a team helping you cover the hospitals, give each person a stack of pre-done hand-written notes to take with them sharing your concern and prayers. You might think it feels impersonal, but I promise the person in the hospital will appreciate a card from their pastor. It is something tangible that will go a long way. 4. Record voice memos of sermon ideas, staff meeting plans, and future ministry strategies. You might not have a chance to come back and write down your ideas while at work. So pull out your phone and record your idea before it gets away from you. You can even send those memos to various team members as voice messages allowing them to start stewing on the idea. 5. Choose family outings where your congregation might also show up. When you go out to your local bowling alley, movie theater, community festivals, farmers markets, or ball games and see people from church, greet them warmly. You don’t have to neglect your family to be in ministry-mode, but just say hello and show interest. It is another connection that makes all the difference. The key to cross vocational ministry is to be intentional and strategic. You must maximize your time and take advantage of the little things that can make a huge difference. What ideas or modifications would you suggest? Leave a comment. Over the past several months, I have been researching trends and developments which I believe will result in an explosion of cross vocational ministry across the Southern Baptist Convention (SBC) in the coming years. I would like to identify six (6) issues which I believe will culminate in a huge increase in cross vocational ministry leaders across the convention. 1. Church planting. As the SBC continues to start, launch, plant, and multiple new churches, the ministry staff of these new churches usually begin as individual church planters or part of a church planting team. There are no full-time ministry leaders in the new church plant for a period of time, therefore, everyone is cross vocational. Once the church is more established, I believe some leaders might want to remain as they started. 2. Health insurance premiums. The cost of health insurance for self-employed individuals (such as church staff members) is outrageous. Many pastors and ministry leaders will need another job in order to help pay the healthcare bills or to have an employer who can provide health insurance for their family. Family self-employed insurance can reach $10,000 to $12,000 per year. 3. Decline in cultural Christianity. As the American culture becomes more secular, more post-Christian, even anti-Christian, ministry leaders will need to access multiple avenues in the marketplace to meet and engage with unbelieving people. Much like cross cultural missionaries in an international context use work platforms, church ministry leaders are seeing less and less unbelieving people seeking out the Gospel or a church on their own. They are not banging down the doors to get into church. Therefore the cross vocational ministry leader has more opportunity for evangelism and outreach if they are in the workplace than if they are isolated in the church office. 4. Smaller budgets, smaller full time staffs. While giving to the IMB & NAMB missions offerings are up, overall church giving and budgets are continuing to decline. Builders, who are the most generous and faithful, are passing away. Boomers are moving toward their retirement fixed income and struggling to pay for rising healthcare costs. Gen. X’ers are saddled with consumer debt and are not very generous as a generation in general. The Millennials, who are very generous, feel more compelled to give to social causes than local churches. The result is smaller church budgets which results in less funding for personnel. 5. Accessibility of online theological education. More and more ministry leader are exploring online theological education. The cost is affordable. The availability is endless. The flexibility is tremendous. Decades ago, theological education required relocating to a seminary, finding a new job, new church, new place to live. None of those are required now. Cross vocational ministry leaders who are presenting serving in a company and a church who thought they would never have the opportunity to study and learn can take online courses from anywhere. I had an online Master of Theology student who was a full-time Bible teacher at a Christian high school and served as a part-time youth pastor in his church. The thought of leaving both the job and the church did not sit well with him, nor his wife. He decided online theological education was the way to go and it worked very well for him. His high school and church both chipped in for his tuition, which made the cost very reasonable. 6. Threat of tax-exempt tax status removal. There has been recent discussion about the ending of the tax exempt status for churches and non-profit ministries. If this does come down in the coming decade, churches will have to position themselves to work with less funding due to the tax liability. In my humble opinion, the way around these issues is to bring on more cross vocational ministry leaders in a variety of positions or roles. What if the whole church staff was cross vocational? What if your church had the funding for two full-time positions and instead of two FT’ers, you moved toward four cross vocational leaders. You double your ministry staff in one swoop. I once suggested to a church that was seeking to bring on a FT senior pastor for 90k annually to consider bringing on three or four cross vocational staff instead. If they took the senior pastor job description and broke it into three parts – preaching/teaching, administration, and pastoral care – they could fill all three roles with part-time leaders for 25k each and still have enough funds to add a ministry assistant or intern using the same 90k package. Four staff for the price of one. Certainly the look and feel of the ministry staff would be different, but consider the benefits: more numeric staff, more connections to various groups within the community, more relevance in the marketplace, and more innovation to break the traditional staffing mold with a new structure that looks more missional. The church choose to not take my suggestion. It was simply too radical for their liking. Cross vocational ministry has always been present in the SBC, but I believe it is about to gain momentum out of necessity and innovative thinking. In recent months, my role as a cross vocational minister has changed. If you are not familiar with the term “cross vocational,” it’s because I made it up. Cross vocational ministry is my invented term for what was once called bi-vocational ministry. I prefer the term cross vocational because the ministry leader has an everyday, normal job and a ministry calling which are constantly crossing over one another. At times, the day job is the primary focus and at other times, the ministry role is primary. The cross vocational minister is constantly attempting to balance the two. I also like the idea of “cross” vocational in the implication of Jesus Christ, who went to the cross, dying for sin, making a bridge for mankind to “cross” over from death to life. In recent days, my day job at Campbellsville University has become quite a bit more demanding. After seven years of full-time teaching faculty, I have now taken on a role in academic administration in addition to teaching. Whereas faculty members have flexibility in their weekly teaching schedule, academic administration is more of a 40 hours per week, 8 to 5, kind of job. What I am now facing is what most cross vocational ministers have faced for years. They work a full-time job, then switch, or cross over, to the ministry in early mornings, evenings and on weekends. The time demands are pressing when it comes to sermon preparation, church leadership, communicating vision, and attempting to perform some level of outreach and pastoral care. The main lesson I am learning in balancing these demands is that organization and preparation must be way in advance. Time is limited in a full daily schedule, therefore the cross vocational minister must use every free moment to be planning, preparing, and working far in advance. You never know when your schedule is going to change at the day job. You might be called in for training or need to make a business trip or be given an assignment that must be finished by Friday. In order to meet these demands and the ministry tasks, you have to utilize every tool available to be organized, prepared and focused. Here are some tips I’ve gathered for organization and preparation in cross vocational ministry. 1. Use your breaks wisely such as Christmas break, spring break, or long holiday weekends. Use these extra days off to plan ahead. I know there are other things on your agenda, but this “free” day might be enough to prepare several sermons or put together a major outreach effort. 2. Be constantly taking notes and jotting down ideas. Use your smart phone or iPad to track thoughts that might come at the gym, on the road, at a lunch break, or even in the shower. Carry a ministry journal with you everywhere working on upcoming sermons or to-do lists for ministry projects. Pack a few blank note cards with you and when you are waiting for a haircut or a doctor’s appointment, write a note to a new member or a family that is struggling. 3. Communicate using web-based tools. Use group emails, group texts, and group document sharing tools to keep everyone in the loop. The more you communicate digitally, the more your team (who is probably cross vocational as well) will be able to do their work without a face to face meeting. Social media and email can also help you connect to the wider church family without being “physically” present for everything. 4. Plan worship services collaboratively using Planning Center Online (planningcenteronline.com). If you are the primary teaching pastor (as I am), use Planning Center Online to let other worship leaders including your worship minister, media team, vocalist, ushers, etc., know what you are planning far in advance. You might not get the opportunity to do a sit-down worship planning meeting, but at least they will know where you are going and what you are expecting weeks (or months) in advance. I plan on writing more this week about cross vocational ministry and several new implications for this type of ministry in the days to come. From all indicators, cross vocational ministry is going to intensify and grow in the coming decade. It seemed the goal of every seminarian I studied with was to be called as a full-time pastor, minister, missionary, non-profit leader, etc. Rarely did I meet anyone whose desire was to be cross-vocational. The singular aspiration was to find full-time support with full-time benefits, combing with a full-time salary, resulting in full-time demands in their ministry calling. The idea of going cross-vocational (my terminology for bi-vocational) was the furthest thing from their mind. And to be honest, as a 20-something seminarian, I had the same mindset. While I served cross-vocationally my entire seminary life (i.e., working at a publishing company, a community center, a toy store, parking cars at a country club, substitute teaching while serving as a part-time youth minister), I dreamed of one day being on full-time staff. I desperately wanted to be called to one place serving them full-time so I could be single-minded in my vocation and not so tired from running all over the place trying to make ends meet. So when seminary graduation came, my hopes for full-time ministry were finally fulfilled. I was called to serve a church as a full-time associate pastor. That is what I did for the next 5 years. I served full-time, 40, 50, 60 hours per week, week in and week out. I thought I had finally made it to the big time. But quickly I started noticing something I had not anticipated. I started noticing that I was constantly surrounded with Christian people. All my friends were Christians. All the people I interacted with on a weekly basis were Christians. Most of the time the only people I saw were church members and their families. The demands of full-time ministry pushed me further and further into an entirely Christian sub-culture. I rarely heard cuss words anymore. I rarely saw people get drunk and stumble out to their car. I rarely heard any of the office gossip I remembered from the publishing company, because my office was now a church office. My full-time ministry was pulling me further into a vacuum-like tunnel where all I did was serve Christian people, teach Christian people, counsel Christian people and walk alongside Christian people. Encountering someone without a relationship with Jesus Christ was rare. This is the danger of full-time ministry, particularly in a local church. On the mission field and in the non-profit world, there are plenty of interactions with unbelievers, but church-based pastoral ministry can be very insulated from the real depth of spiritual lostness. That is why I have loved (and thrived) in cross-vocational ministry on the Christian college campus. My university admits all sorts of people, believers and unbelievers, domestic and internationals. While I am still somewhat in a Christian bubble, I do interact with all sorts of people who know very little about Jesus or even nothing at all. They are students in my classes, athletes on scholarship, internationals studying abroad, and non-traditional students giving college a second chance. I still serve the local church and love preaching and teaching God’s Word to God’s people, but being connected with unbelievers reminds me that Jesus came into the world to save sinners like me. He came and died and commissioned us to live sent, live missionally, live in a world that desperately needs to know Him. Cross-vocational ministry has provided a much easier path to missional living than full-time church ministry ever could have. I pray that more and more pastors, ministers, and seminarians will consider giving their lives to cross-vocational ministry as a life calling. 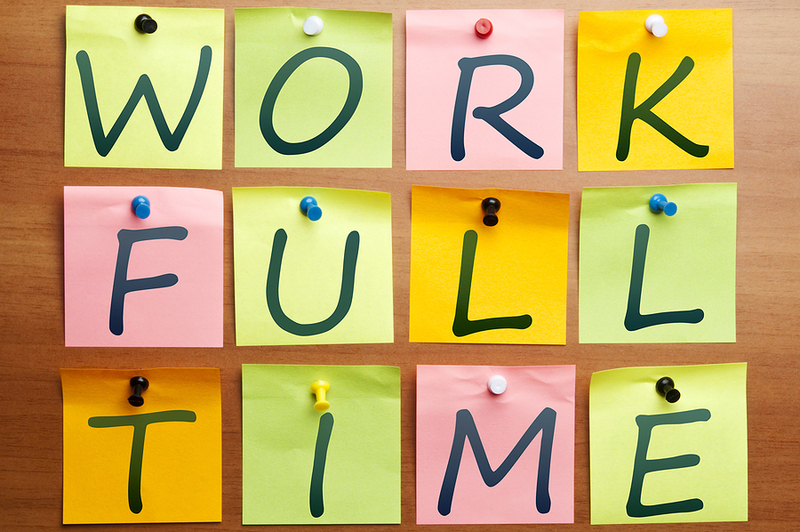 Full-time is nice, cross-vo (in my humble opinion) is better. I have been involved in bi-vocational ministry for the past 6 years. This simply means I work a normal, full-time job (for me on the faculty of a Christian university) and serve part-time in local churches. I have loved every minute in this dual ministry role. What I do not love is the terminology: bi-vo. Bi-vo, short for bi-vocational, has a negative connotation to it. To most people in the pews it means that their pastor or church staff member is split in two. That your heart is divided. That you have to focused on one job to the detriment of the other. As if you are in a tug-of-war between two jobs – one will win, the other will lose. In bi-vo ministry, someone wins, someone will lose. While more and more churches are considering going bi-vo because of financial constraints and/or declining attendance, they feel having a bi-vo pastor or bi-vo worship leader is a sign of defeat and impending death. In all actuality, bi-vo can be a huge boost in lay-ministry involvement, community engagement and potential outreach. Therefore, I think we need to change the language. I think we need to reframe the vision and conversation surrounding bi-vocational ministry. From this point forward, I will use the phrase “cross-vocational” instead of bi-vo. 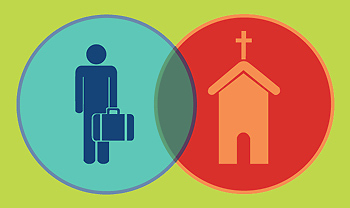 Cross-vocational means you are living equally in two worlds: the marketplace and the ministry location. Cross-vocational means you have on-going relationships with two groups simultaneously – your brothers and sisters in Christ and those you serve in the workplace. Cross-vocational means you are fluid, entrepreneurial, creative, willing to be flexible, able to lead and succeed in both contexts. Cross-vocational ministry has been the calling card of our missionaries and church planters for centuries. They all have had to work both sides of the ministry field, in the world and out of the world, serving those who have yet to hear and to those who are fully committed to Christ. I believe the cross-vocational spirit will come to more and more pastors and church leaders in the days ahead. I believe a cross-vocational shift is coming in America for three primary reasons. 2. As evangelism and baptisms decrease, pastors and church leaders will demand freedom to engage unreached people within their communities. This access will only come from unhinging themselves from a pervasive Christian sub-culture inside the church and interacting with more non-believers out in the real world. 3. As churches streamlining and simplifying their ministry efforts and programming (aka the winnowing effect), they will have to say “no” to the secondary, more peripheral ministries in lieu of keeping the essential ministries. The end result will be less day-to-day work to do. This means less needed, fully-funded paid staff. I do not see any way around this ministry shift. I do see a large number of churches really struggling with this new reality. But if they want to be proactive, they might consider going cross-vo now when its their choice instead of going cross-vo later when they have no choice.